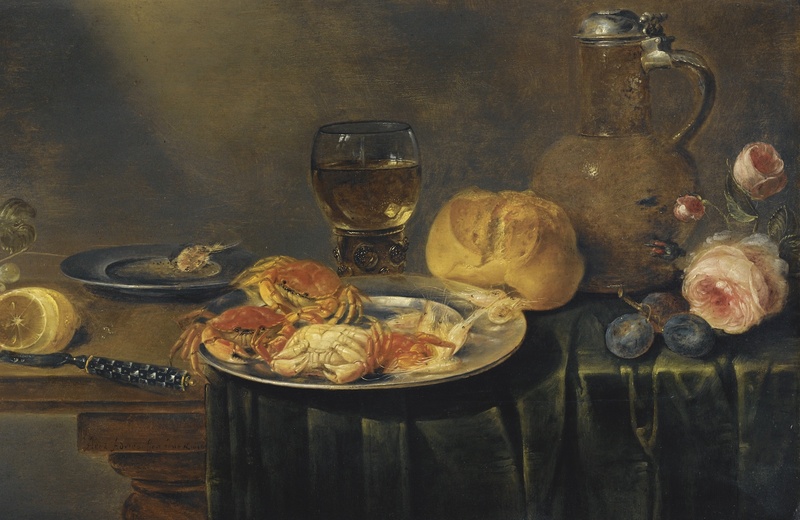 "A Still Life with Roses, a Jug, a Loaf of Bread, a Filled Wine Glass, Two Plates with Prawns and Crabs, a Knife, a Partly-Peeled Lemon and Grapes over a Partly-Draped Table," Alexander Adriaenssen, 1646. If the past few weeks are any indication, the long-dreaded “S-word” is enjoying a somewhat astonishing ascendancy in American political discourse. Already thawed to some extent by the unexpected success of the Bernie Sanders presidential campaign, the “democratic socialist” label and its accompanying connotations appear to be emerging from their post-McCarthyite chill. Following the stunning victory of Democratic Socialists of America (DSA) member Alexandria Ocasio-Cortez in a New York congressional primary last month, the change of mood could immediately be registered in the anguished reactions of conservative pundits who’ve spent the past few decades tarring Democrats of all stripes with the “socialist” label (without, it would seem, ever expecting to have to grapple with those unafraid to embrace the term). Not to be outdone, some liberals — including House minority leader Nancy Pelosi — have moved swiftly to downplay or delegitimize the election’s significance and reassure a shaken donor class that socialist politics are not, in fact, gaining momentum. Some more establishment, corporate Democrats get very scared by this term but if democratic socialism means that you believe health care, housing, education and the things we need to thrive should be a basic right not a privilege then count me in. However one interprets Nixon’s ideological sincerity, her rhetorical shift clearly speaks to the growing appeal of socialist values in Trump’s America and should be viewed as an indicator of progress, albeit a modest one. A context in which a competitive candidate for the gubernatorial nomination of a major party in a large state wants to be associated with democratic socialism can only be an opportunity, and if the operative definition of the label remains incomplete, it only means that there is more work to be done in amending and expanding it. Of course, finding consensus within the Left on the true definition of “democratic socialism” is about as probable as striking up a friendly conversation about Marx in an elevator at Goldman Sachs HQ: the schisms — historical, tactical, and strategic — being notoriously many and unlikely to leave us any time soon. Nonetheless, Nixon’s own limited description actually gives us some useful anchors with which to sketch out in the abstract some of the values and objectives that have historically animated democratic socialists, broadly defined. Over and against liberals — who have historically championed a system incorporating markets, representative government, and a basic package of civil and political rights — socialists have long contended that capitalist democracy fails to promote human freedom in several important respects. In response, they have asserted their own vision — simultaneously moral, ethical, and institutional — of what real freedom and equality truly imply. As the currency of democratic socialism continues to rise, and the liberal strategy potentially shifts from one of outright rejection to one of appropriation and attempted absorption, it is worth considering a few of the foundations upon which it has historically grounded itself. One historic point of divergence between socialists and many liberals is the former’s recognition that the profit mechanism at the core of the market is divorced from actual social need. There’s no profit in, say, providing health care for every person as a right — in fact, the market more or less incentivizes the opposite (the more there is of something, the less valuable it tends to be to capitalists). It’s this structural failure that allows millions to be without the necessities of life, even — especially — in societies like the modern United States where resources and wealth are abundant. And where basic needs are not met, socialists contend, freedom is a largely vacant construct. This brings us to a second and intimately related reason: namely, that the capitalist market not only encourages, but guarantees inequality and exploitation. Capitalist societies are by definition class societies, and those deprived of the basic necessities of life are more than simply the “less fortunate.” They are the victims of a materially unequal society in which the ownership of wealth, and the social and political power that comes with it, remains heavily concentrated. To the socialist, then, there is no distinction between the “deserving” or “undeserving” poor, just a deprived class of people whose needs have yet to be met. The solution is the redistribution of wealth and power from the few to the many. So said American socialist-feminist Rose Schneiderman in the early twentieth century — words that have continued to animate and inspire socialists ever since. Schneiderman’s slogan eloquently conveys that the socialist struggle, while undoubtedly concerned with securing the necessities of life for all people, is ultimately about something far more precious and hopeful: the flourishing of abundant life in all its complexities and potential. Human beings are not meaningfully free when they have only the basics of survival and the greatest joys and offerings of life — luxuries, music, education, travel — are restricted to a wealthy few. Nor, for the socialist, are people free when the price of subsistence, let alone comfort, is degrading or alienating work into which they must involuntarily sink years of their lives. As the famous image from Charlie Chaplin’s 1936 film Modern Times so brilliantly depicts, capitalism relentlessly tries to mold us in its own image, into feverishly competitive, acquisitive agents of its market algorithms. People “thrive” under capitalism when they reach (or are simply born into) the top of a class hierarchy that tends to equate wealth with both social utility and moral desert. People thrive under socialism when they are given maximum freedom and time to relax, inquire, nurture their own creativity, and pursue their own ends rather than being leveraged as means. The one-sided focus of most Marxists and socialists on distributional questions has obscured the fact that the animating principle of the Left is not so much equality, but rather freedom—freedom from alienating work and freedom to use our time and creativity for our own self-directed ends. Socialism does not equal the roughly equal distribution of stuff; the martyrs of the labor movement didn’t give up their lives so that everyone could have the right to buy an iPhone or a plasma screen TV, or to waste their lives working at crap jobs. For all but the very wealthy, freedom of this kind remains obscure or limited even for comparatively privileged middle-class people in industrialized societies. While social-democratic efforts like debt-free education and reduced workweeks have, albeit in partial and fleeting forms, successfully expanded it for a few, democratic socialism aims to win it, permanently, for the many. Another feature that separates socialism from liberalism, at least of the contemporary kind, is its acknowledgment and embrace of antagonism. Whereas the idea of citizenship common to most liberal states implicitly posits that we are all equal as individuals participating in markets, political parties, and voluntary social networks (with any residual inequality either accidental, deserved, or functionally necessary), socialists seek a collective response built on the acknowledgement of inequality and injustice. Against the astroturfed cohesion evinced by appeals to The National Interest or platitudes like “Billionaires are just as patriotic as laid-off southern farm hands on Social Security!” socialists look to create meaningful solidarities between oppressed individuals and groups wherever they are and turn them into political power for the common good. This means not only a recognition of current class divisions, but also of the deep and abiding injustices in every society and the exclusions and prejudices they foster — from the cardinal sins of slavery and colonialism to the subordination of women and the oppression of queer and trans people. While socialists necessarily dedicate themselves to many different struggles, some of them local and some of them global, their deep commitment is to internationalism and peace. Put in the simplest terms, democratic socialism pursues a richer, more inclusive, and infinitely more textured definition of “we” as the foundation for political community — with democracy being both its means and its end. In this disorienting moment of hope, despair, and opportunity, it is this vision that must continue to glow, incandescent, as our guiding light.